Posted on April 15, 2019 by Sarah Forrest and filed under Twitter and tagged tax day irs wwe. Posted on April 5, 2019 by Sarah Forrest and filed under Twitter and tagged wwe wrestlemania high tech twitter. @KatieLinendoll: Repost @notsam: Guess who’s back! @KatieLinendoll returns to #NotsamWrestling to breakdown everything going in to WrestleMania! Guess who’s back! @KatieLinendoll returns to #NotsamWrestling to breakdown everything going in to WrestleMania! Posted on March 28, 2019 by Sarah Forrest and filed under Twitter and tagged Sam Roberts Wrestling Podcast podcast wwe wrestlemania. Posted on March 26, 2019 by Sarah Forrest and filed under Twitter and tagged amhq Weather Channel stem. Posted on March 25, 2019 by Sarah Forrest and filed under Digital and tagged the cut the new yorker how i get it done. Posted on March 18, 2019 by Sarah Forrest and filed under Twitter and tagged AroundTheWorldInKatieDays Valley of Fire Overton Nevada. Posted on March 14, 2019 by Sarah Forrest and filed under Twitter and tagged rvx waze omar johnson uri levine ad rv experience salt lake city. @KatieLinendoll: Co Hosting with Cardinal Dolan Today! Posted on March 12, 2019 by Sarah Forrest and filed under Twitter and tagged siriusxm catholic channel Conversation with Cardinal Dolan. Posted on February 22, 2019 by Sarah Forrest and filed under On Air and tagged the da show iceland winter running gadgets. A practical add-on for any runner or outdoor enthusiast, Road ID offers different wearables that provide your contact and/or medical information. Rest assured that your ID is always on you even when you’re exploring off the grid. I recommend these spikes for anyone who runs in the more extreme winter conditions. These overlays can be strapped to any pair of boots or shoes and will seriously help you get a grip the terrain. A variety of brands offer options from YakTrax and Nordic Grips to Traxole (this is the brand I prefer). Ice Bug shoes are also available with the spikes already built right in. Stay safe and lit using this NOVA LED lightweight jacket. It uses a unique 0.5 oz battery module that you clip inside the coat to illuminate various parts of the jacket. It has three mode options (high, low and blinking) and carries a 6- 8 hour charge after charging for just one hour. It’s also lightweight, weather resistant and provides about 450 ft of visibility. Let’s call it what it really is - a fanny pack. I said I’d never do it, but I'm legit digging the convenience of this bag! 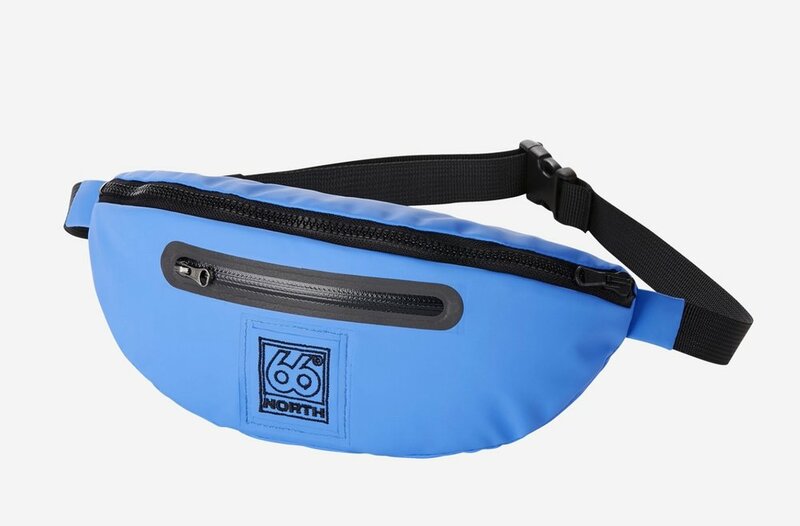 I especially like the Icelandic brand, 66 Degrees, so I had to give their waterproof fanny pack a try. And, I have to admit it is awesome to carry all the essentials that you need on a run. Posted on February 22, 2019 by Sarah Forrest and filed under On Air and tagged run gadgets iceland night time running The DA SHOW. After a winter 10k run in Iceland, Katie Linendoll chats with Icelandic triathlete, Dagny Jonsdottir, who shares what it’s like training in the land of fire and ice. She primarily runs outdoors — and likes to challenge herself with uphill terrain in the snowiest and most extreme conditions. Posted on February 21, 2019 by Sarah Forrest and filed under Katie.Show and tagged iceland 10k winter run race dagny jonsdottir. Posted on February 19, 2019 by Sarah Forrest and filed under Twitter and tagged shoes geek and glam. Posted on February 19, 2019 by Sarah Forrest and filed under Twitter and tagged toy fair 2019 nyc. Posted on February 17, 2019 by Sarah Forrest and filed under Twitter and tagged toy fair 2019. Posted on February 16, 2019 by Sarah Forrest and filed under Twitter and tagged iceland northern lights tetris. Posted on February 12, 2019 by Sarah Forrest and filed under Twitter and tagged iceland. @KatieLinendoll: It's Northern Lights season! I've put together a video of the best gear, camera settings, lighting and locations for capturing the aurora borealis 🌌✨https://www. Posted on February 11, 2019 by Sarah Forrest and filed under Twitter and tagged twitter norther lights photography. Posted on January 30, 2019 by Sarah Forrest and filed under Twitter and tagged twitter.